It's beginning to look a lot like Christmas! We're gearing up for the holiday season here, and though the weather outside might be frightful, the deals at Bloomex are delightfulHere's our latest entry in our 12 Days of Christmas series. On the fifth day of Christmas, my true love gave to me... a bouquet of Peruvian Lilies! Roses, Carnations and Poinsettias get most of the attention in terms of flowers around the Christmas season, but this bouquet of Alstroemeria deserves the spotlight. Alstroemeria are commonly known as Peruvian Lilies, and upwards of 25 stems are included in this arrangement, each containing multiple blooms. 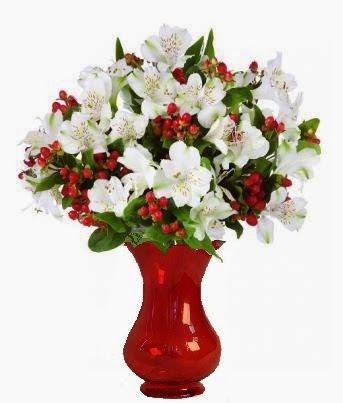 The Lilies are adorned by lovely Red Hypericum Berries. This is one bouquet that defintiely features the colours of the season in all their glory. Check out our product page at bloomex.ca, and check back tomorrow for Day 6 of this series as we mark the half-way point. It's beginning to look a lot like Christmas! We're gearing up for the holiday season here, and though the weather outside might be frightful, the deals at Bloomex are delightful. Here's our latest entry in our 12 Days of Christmas series.